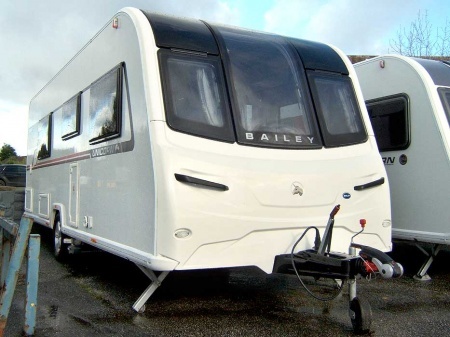 This 4 berth caravan is not only in a very nice condition, but this Coachman VIP 520-4 also comes with a motor-mover ( Please note: motor-movers are not included in the warranty ). 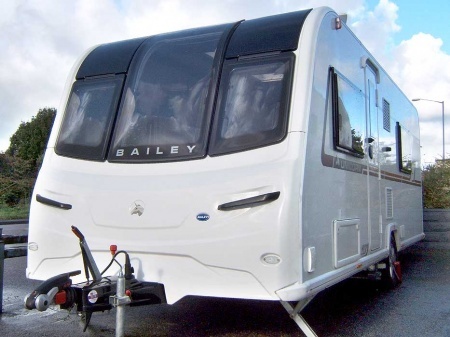 Motor movers just make the process of getting the caravan in the perfect final position - either on-site or at home - just that bit more easier and less likely to cause back-strain. The AKS stabiliser helps provide a somewhat more assured towing experience. Seating - each seat measures 1.88 metres. This is the actual length of the seating. The actual available seating length - after cushions are put in place and from the end of the seat up to the drawer cabinet is 1.32 metres. Seating is still comfortable and firm. Night-Time Lighting - the lounge has 4 directional spotlights each with their own switch. This means that you can select which ones to have on or off. In addition to these there is a ceiling mounted strip light with a coverplate diffuser to reduce the harshness of the light source. Daylight - daylight into the front lounge is provided by the surrounding side and front windows, the front skylight and the rooflight. 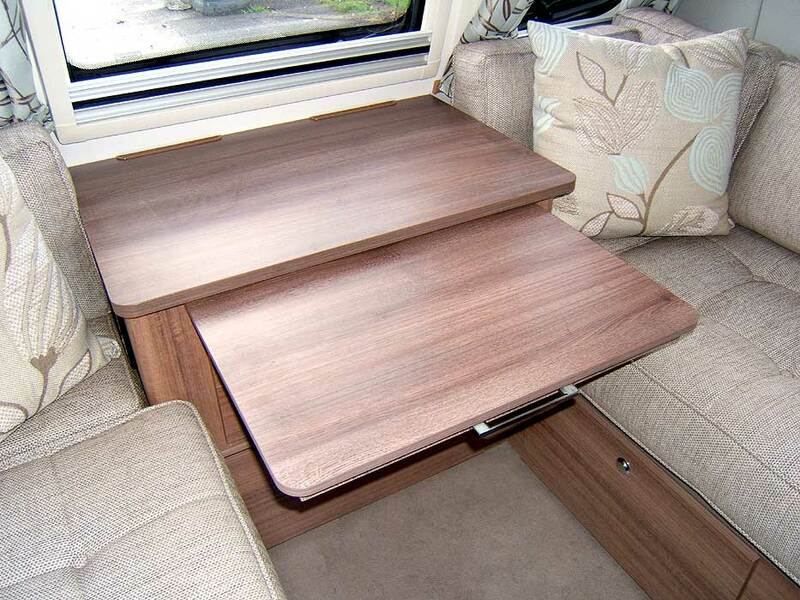 Storage - The lounge has 4 standard sized overhead lockers plus 2 smaller, but nevertheless useful corner lockers. 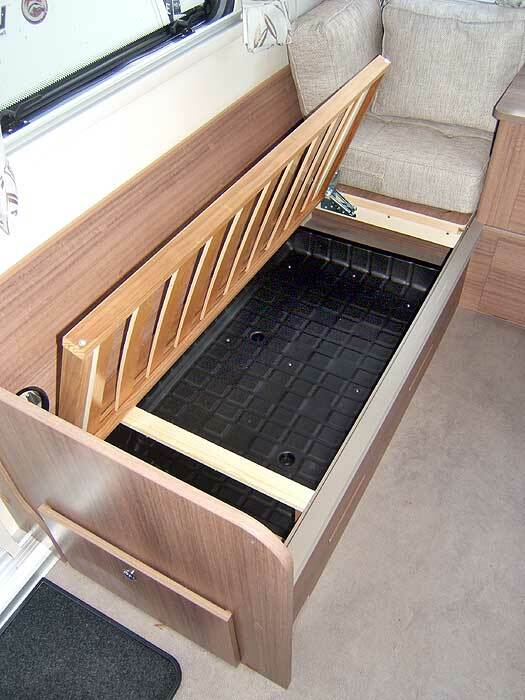 In addition to these there are 3 drawers in the cabinet between the seats and storage beneath the seats. There is partial front access to the space under the seats only. By removing the seat cushions and lifting the slatted wood frame you gain full access to the space. 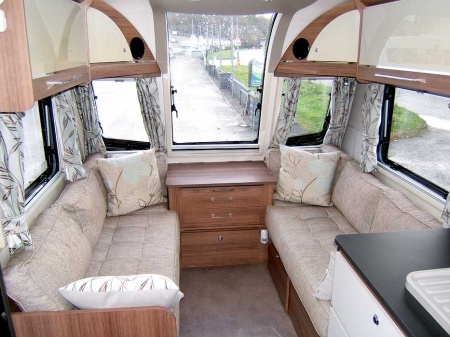 Using As A Sleeping Area - The front lounge has an Easy Bed Make-Up System. 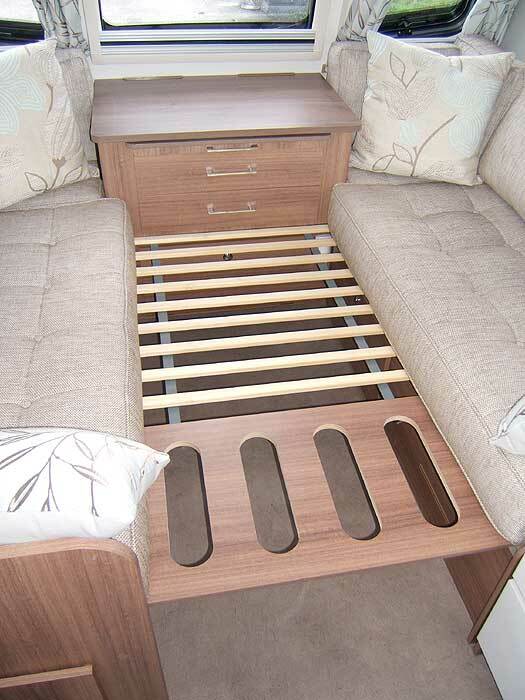 This is an array of wooden slats that in this caravan, pulls across the space between the seats. It makes the process of changing the lounge into a sleeping area easier and less tiresome. To cut out light, all rooflights and windows have integral pleated blinds. 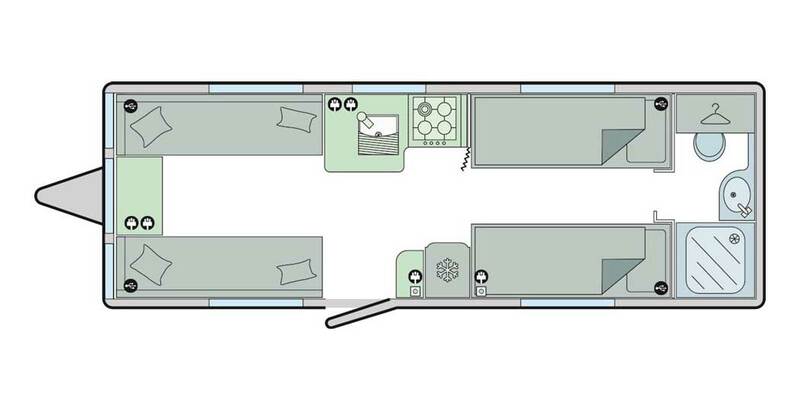 You can make the area into a double bed; 6' 11" x 4' 10" or two singles 6' 2" x 2' 6"
Other - There is a JVC KDR233 Radio / CD player hidden in one of the overhead lockers. This is connected to two stereo speakers for entertainment and your enjoyment. There is also a TV connection point set down into the bottom panel of one of the seats. The top of the drawer cabinet provides a handy pull-out occasional table. Storage - The kitchen has 3 good sized overhead storage cupboards but one is taken up by housing the microwave. Beneath the worktop is a cutlery drawer and a quite deep, double fronted cupboard. There is also a useful cupboard beneath the oven. Daylight - as well as the window behind the sink, daylight comes into the area via the window from the dining area on the opposite side. Night-Time Lighting - a long LED striplight is located under the overhead lockers so that it shines onto the sink and worktop. It has it's own switch. 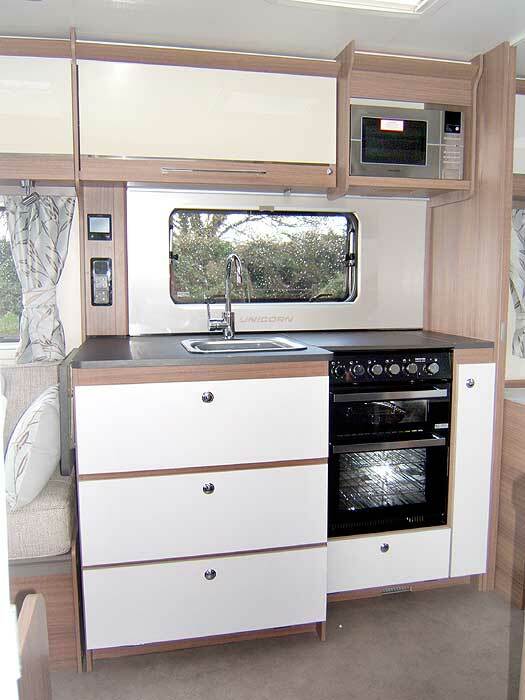 Cooker - The kitchen is fitted with a Thetford Aspire oven and grill. 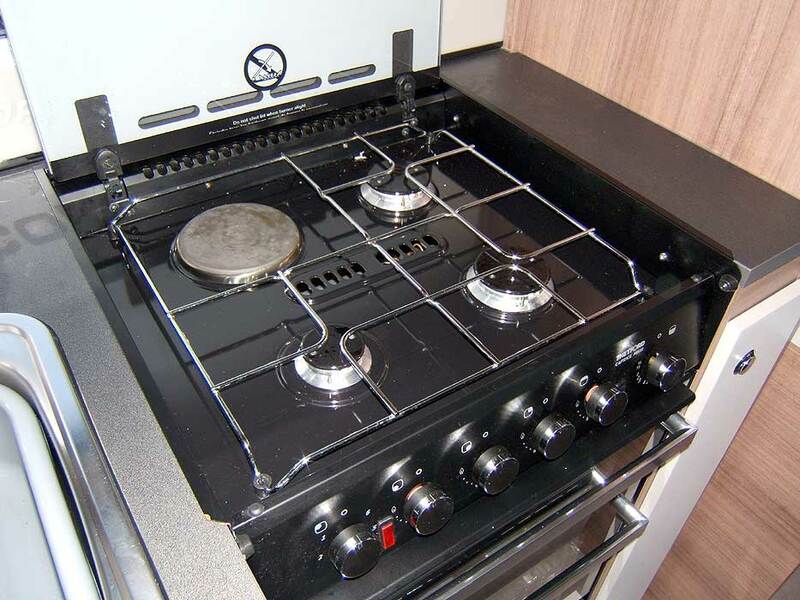 Hob - the Thetford dual fuel hob has 3 gas burners and an electric hotplate with electronic ignition and flame failure. Refrigerator - The kitchen comes with a Thetford 107 litre refrigerator with 11 litre freezer top box and electronic ignition. 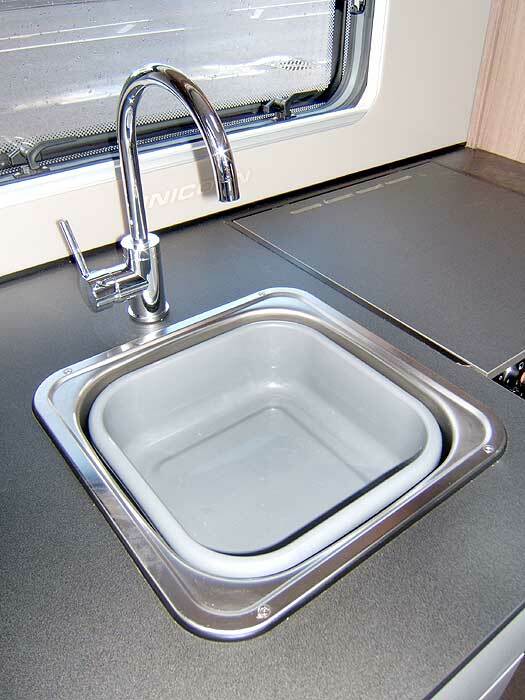 Sink - a large sink and drainer with single mixer tap. Other - there is a roof vent / fan extractor in the ceiling to reduce condensation from cooking. Sensibly situated directly opposite the main Kitchen area in the caravan, the dining area offers comfort and convenience at meal-times. The seats are comfortable and pleasant to use. This area can also double up as a sleeping area at night. Storage - There are 3 overhead lockers in the dining area. It is likely that these would be utilised as kitchen cupboards. In addition, each seat has storage space under the seating itself. Daylight - a good sized, side window provides daylight whilst light also comes from the front door and the kitchen window. 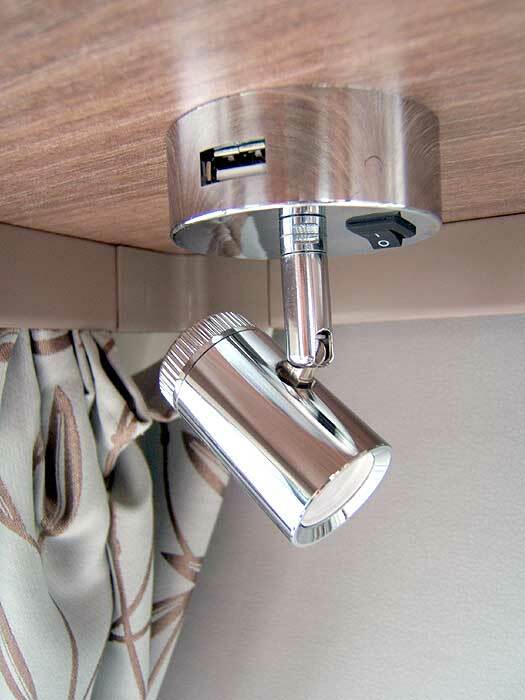 Night-Time Lighting - a long LED striplight is located under the overhead lockers so that it shines onto the dining table and is also available at night if there area is being used for sleeping. 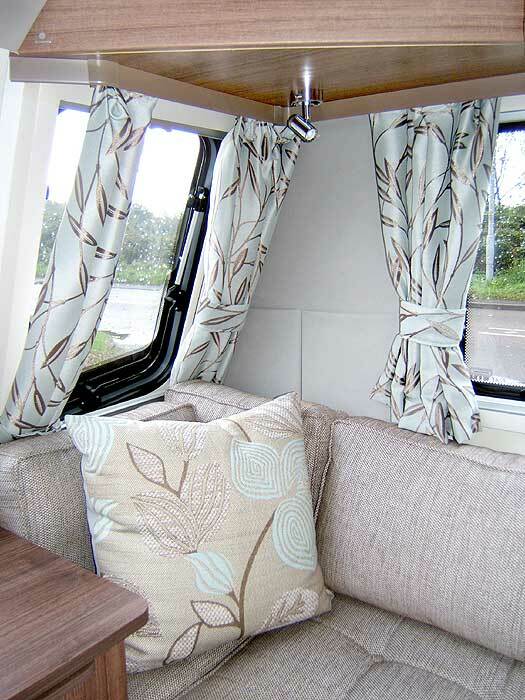 Other - when being used for sleeping the area can be separated off via the curtain that runs on the ceiling mounted rail. 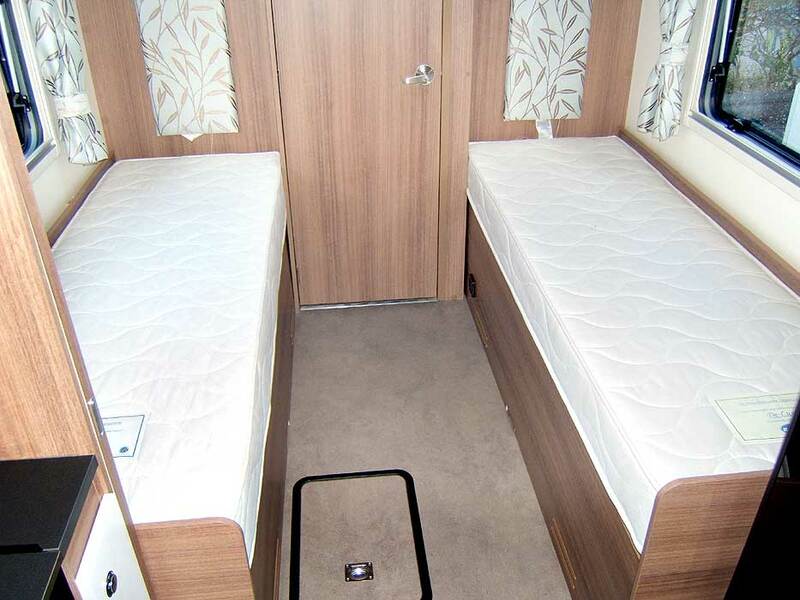 The area provides a bed measuring 6' 0" x 2' 4" and a Single Bunk: 5' 9" x 2' 0"
There is a small dedicated TV station area with TV connection point and both 12 volt and mains power sockets. It is situated between the front lounge and the dining area and can there serve both areas easily. The aerial connection point is of course linked to a signal booster and aerial. There is both cupboard space and shelving provided for storage need although this can be utilised as extra kitchen storage if you prefer. We will walk you around the washroom. 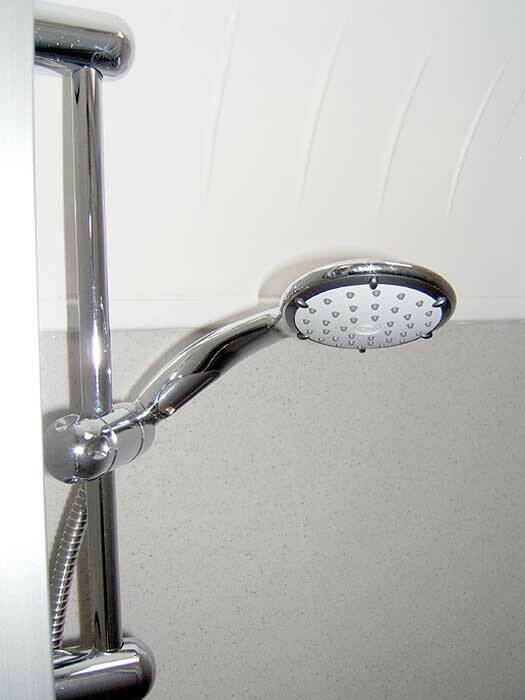 Immediately on your left is the circular shower cubicle - measuring 67 cm in diameter approximately. Next, you will find the Thetford C260 cassette toilet that has electric flush. The toilet is not cramped and has a good amount of space around it. Above it on the wall is a useful cupboard. Notice also the wall mounted tail rail. Next you find the good sized washbasin. This has a large wall mounted mirror above it and another good sized and useful cupboard beneath it. Moving round again, you come to a collection of shelves and a large wardrobe type cupboard. The shelves are cleverly designed so that they provide quick access by the washbasin but also provide shelving inside the large cupboard as well. The cupboard has the usual hanging rail and really is quite sizeable and has 2 good sized drawers at the bottom. Finally, a small, narrow cupboard provides an excellent storage space for the dining table. Night-Time Lighting - There are 2 fixed spotlights for night-time lighting. Daylight - there is a window to the left of the washbasin and also a rooflight - this can of course also be used to ventilate the area and reduce the build-up of condensation. 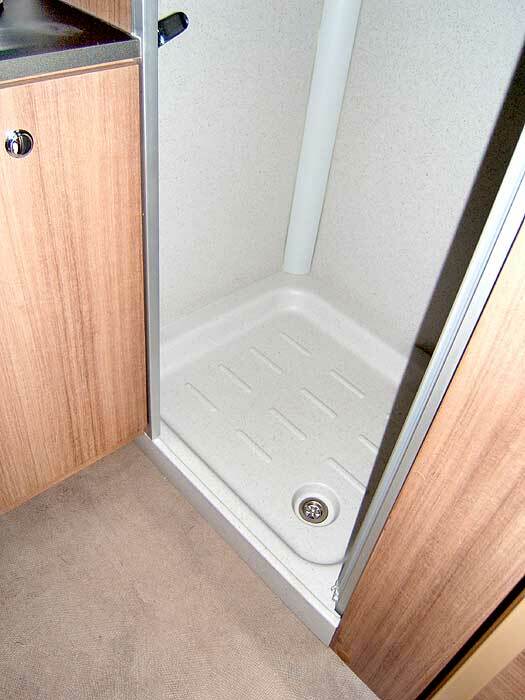 Shower Cubicle - The shower measures 67cm diameter approximately. It has a curved, sliding entrance/exit door. Chassis - an AL-KO galvanised chasis with Euro-axle. AL-KO AKS 2004 Stabiliser - stabilisers reduce rolling and pitching whilst you are towing and significantly improve the smoothness of a journey. They give the driver greater confidence and control. Heating - Truma 3002 3kw gas heater and supplementary 230v Ultraheat system with automatic ignition and silent running night setting. 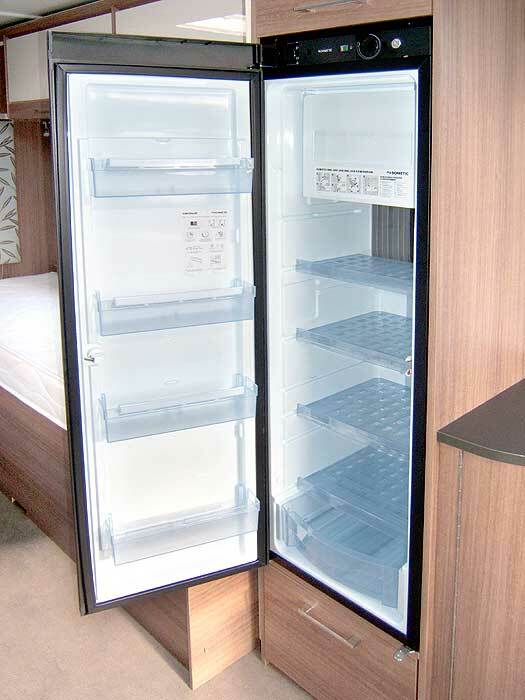 Refrigerator - Dometic 104 litre refrigerator with electronic ignition and full width freezer compartment. 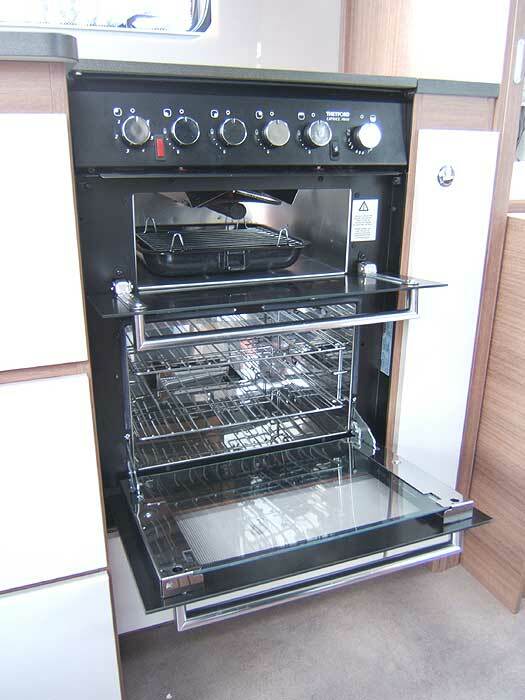 Cooking - Spinflo combined grill and domestic style glass fronted oven with electronic ignition and flame failure device. Spinflo recessed 4-burner hob unit incorporating flush fitting glass hinged lid with conveniently located side controls. Radio / CD Player - with USB connection point. Connected to stereo speakers. 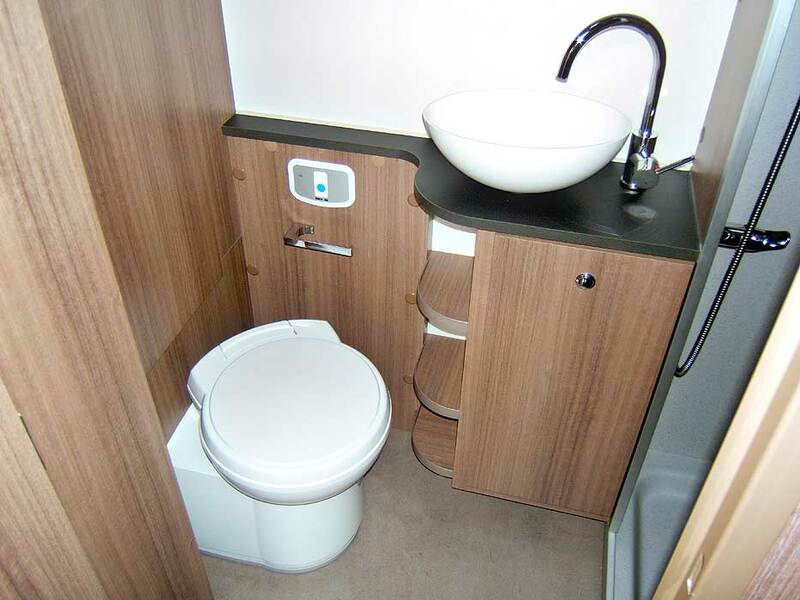 Cassette Toilet - Swivel Thetford casette toilet with electric flush and integrated header tank. Bed Size - Front Double: 7' 0" x 4' 7"
Bed Size - Front Singles: 2 @ 6' 2" x 2' 4"
Stabiliser - AKS stabiliser - stabilisers reduce rolling and pitching whilst you are towing and significantly improve the smoothness of a journey. They give the driver greater confidence and control. Heating - Truma Combi-boiler with programmable timing system for heating and hot water. Cooking - Thetford Aspire oven and grill. Thetford dual fuel hob with electronic ignition and flame failure. Microwave oven. Cassette Toilet - Electric flush Thetford C260 cassette toilet with pump filler. Bed Size - Double: 6' 11" x 4' 10" OR Singles ( x2) 6' 2" x 2' 6"
Bed Size - Single: 6' 0" x 2' 4"
Bed Size - Single Bunk: 5' 9" x 2' 0"